Voici la nouvelle publicité de Guiness, et elle est vraiment impressionante ! Pour marquer le coup, Guiness a réalisé ce spot dans un petit village en Argentine à base d'un domino géant. Ce domino géant compte 6000 domino dont 10,000 livres, 400 pneu, 75 miroirs, 50 frigo, 45 armoires et 6 voitures, ce qui est la publicité la plus chers de Guinness 20 millions de dollars. 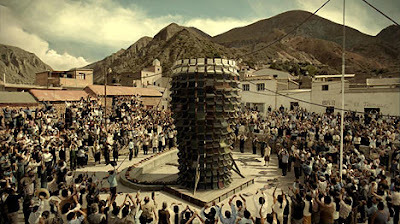 • The advert was shot on location in a remote side village called Iruya, in the Salta region of northern Argentina, with a population of around 1,000 people. • The cast is made up of locals from the village and surrounding area, none of whom had ever appeared in front of a camera before. • The tipping scenes were created by world record breaking domino tipping experts, Domino Domain. • Setting the dominos on the table from the start of the advert took a team of three experts two days, but took just 14 seconds to topple. • Toppling items included: 6,000 dominoes, 10,000 books, 400 tyres, 75 mirrors, 50 fridges, 45 wardrobes and 6 cars. • 24 hours of footage was captured. • The car toppling sequence was successfully shot in just one take.